Father Ihor Okhrimtchouk , B.Th., B.Comp. Sci, B.Ed. As parish priest at Assumption of the Blessed Virgin Ukrainian Orthodox Church since May 2002, Fr. Ihor Okhrimtchouk has provided spiritual care to members of our parish through group lectures, discussion groups and one-on-one counselling. He is passionate about building both a strong Orthodox Christian and Ukrainian cultural community in Ottawa. Born in 1970 in Lanivtsi, Volyn, a village in western Ukraine, Fr. Ihor completed secondary school there and later enrolled in Ternopil Polytechnical Institute prior to conscription in the army of the Soviet Union in 1988. After completing military service, Fr.. Ihor immigrated to Canada in December 1990 and began theological studies in Winnipeg at the Faculty of Theology, St. Andrew’s College, University of Manitoba, eventually completing a Bachelor of Theology degree in 1988. Along with theology, Fr. Ihor took courses at the University of Manitoba in management, economics and computer science. Fr. Ihor was ordained to the diaconate in the Ukrainian Orthodox Church of Canada in 1996 at the Dormition of Theotokos Ukrainian Orthodox Church in Surrey, B.C. Three years later, on October 10, 1999, he was ordained to the Holy Priesthood of the UOCC at the All Saints Ukrainian Orthodox Church in Transcona, Manitoba. Between 1999 and 2002, Fr. 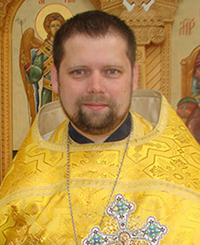 Ihor held pastoral assignments with St. Nicholas Ukrainian Orthodox Church in Portage La Prairie, MB and with Holy Ghost Ukrainian Orthodox Church in Brandon , Manitoba. Father Ihor’s pastoral identity has been strongly influenced by the mentorship of many clergy, lay organizations and laymen and women of the UOCC and other Orthodox clergy as well as clergy from other denominations and faith traditions. A fervent believer in continuing education, Fr. Ihor completed a Bachelor of Computer Science at the University of Manitoba in 2001, and a Bachelor of Education at the University of Ottawa in 2006. He has since completed graduate courses in theology, pastoral care, community dynamics and development at St. Paul University in Ottawa, where he is currently a candidate for a Master of Arts in Counselling. Fr. Ihor is a member of the steering committee of the Ottawa Interfaith Council as well as being a registered member of the Ontario Teachers College. He is frequently called upon as a representative of the Orthodox faith at interdenominational venues in Ottawa. It was also at St. Andrew’s College, University of Manitoba, where Fr. Ihor met Jennifer Atamanchuk, a fourth-generation Ukrainian-Canadian, and a student at the University of Manitoba. On July 22, 1995, Ihor and Jennifer were married at St. George's Ukrainian Orthodox Church in Dauphin, Manitoba. Since their marriage dobrodiyka Jennifer assists Fr. Ihor in many volunteer capacities within the church. Currently, she plays an active role in youth and cultural programming at the church. She is a registered dietitian at the University of Ottawa Heart Institute. The couple have two children.